All treatments for periodontal (gum) disease focus on one goal — to remove any bacterial plaque and calculus (hardened plaque deposits) that are at the heart of the infection. 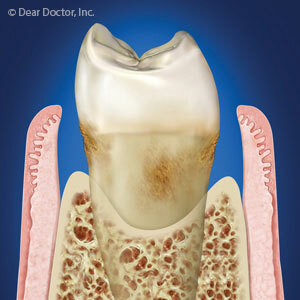 Plaque is a thin surface film of food particles and bacteria that cause gum disease. Plaque builds up on tooth surfaces due to inadequate oral hygiene. And as the disease progresses brushing and flossing won’t be enough — you’ll need our services and specialized equipment to fully remove the plaque and calculus. The basic technique is called scaling in which we remove plaque and calculus manually from tooth surfaces above and just a few millimeters below the gum line. As the disease develops, though, the slight natural gap between teeth and gums may begin to increase to form voids known as periodontal pockets. Filled with infection, these pockets can extend below the gum line onto the roots of the tooth. If the pocket extends more than 4 millimeters, basic scaling may not be able to remove all of the plaque and calculus. Periodontists (dentists who specialize in the treatment and care of gum tissues) can perform a surgical method to access these deeper areas. Known as flap surgery, this procedure aims not only to reach and disinfect periodontal pockets and root surfaces, but also repair damaged gum tissue and create a better environment for future hygiene and treatment. As the name implies, we create an opening in the gum tissue with one side remaining attached to the gum structure — much like the flap of a paper envelope. Through this opening we’re able to reach areas to remove plaque and calculus, as well as install both bone grafts to regenerate lost bone and growth factors to stimulate tissue growth. Once finished, we stitch the flap back into place with sutures and, in many cases, place a moldable dressing to protect and hold the flap secure while the incision heals. This relatively minor procedure can be performed with local anesthesia and requires only a few days of recuperation. The results, though, can provide long-term benefits — reduced infection, better bone and gum health, and a more conducive environment for future maintenance of health — that could save your teeth and your smile for many years to come. What Makes Professional Teeth Whitening Different? Are Dental Implants A Good Option For My Teen?